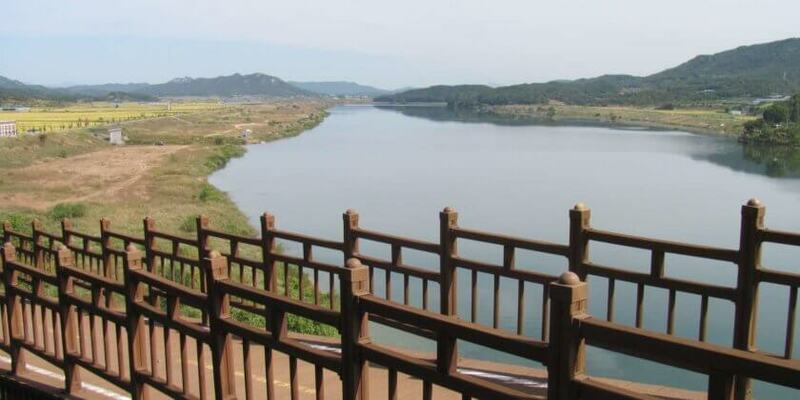 South Korea is a magnificent place to go on your next cycle touring trip. In less than a week a moderately fit cyclist with a minimal amount of equipment and planning can complete the route between South Korea’s two largest cities, riding southeast from Seoul to Busan, or northwest from Busan to Seoul. After checking the dominant wind direction I and my friend chose to cycle the Seoul to Busan route, which we completed in just six days. If you decide to do the entire Seoul to Busan route the distance will be approximately 609 kilometers. The route me and my friend did ended up being 566.5 kilometers. Purchase and download ZIP file containing the most up-to-date GPS tracks for all of the cycling paths along the popular 4 Rivers Seoul to Busan route – These routes will keep you on the main path, cycling past certification booths, motels, restaurants, and camping options. Tracks are in GPX format (works with all Garmin and other brand GPS devices) and KMZ format (works with all smartphones and tablets). You can view these routes on your smartphone, tablet, or GPS device with or without internet connection. 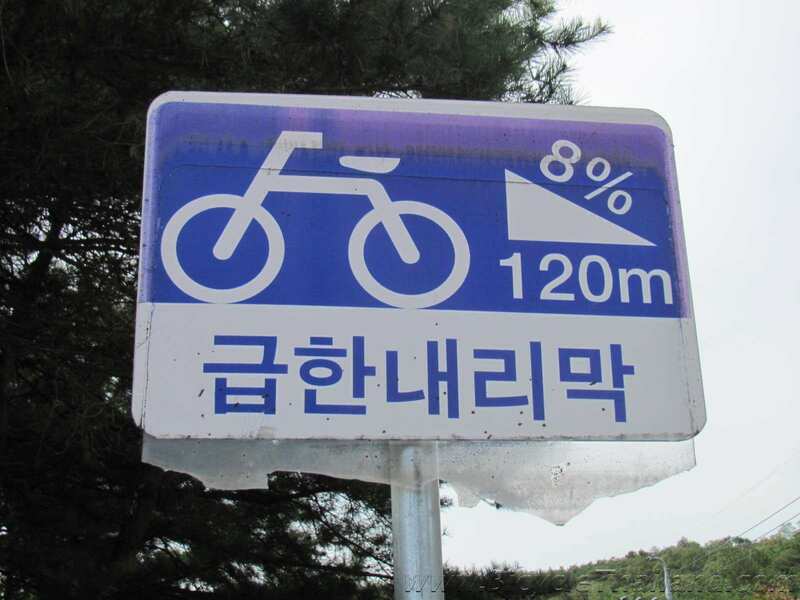 South Korea, best known for Kimchi and K-Pop, caught my interest as a cycling destination at the beginning of 2015. I had visited the Northeast Asian country before but never for a cycling trip, so I was delightfully surprised when I learned that riders were traveling the length of the country along a newly completed route known as the four rivers path. From my previous trips I knew that South Korea’s Summer is HOT and the winter has SNOW so I did a bit of ‘best weather months’ research before settling to do my trip during the month of October. Korea is two hours ahead of Thailand and our Bangkok to Seoul flight took about five hours. Finding an inexpensive flight was quite easy as several airlines service Incheon International Airport (Seoul) and Suvarnabhumi Aiport (Bangkok). Learn how to box your bicycle in preparation for taking it on an airplane. On a previous trip to Japan I visited prominent bicycle shops in Tokyo and got an overall feel of the bicycle culture in Japanese daily life, to serve as a comparison model to the burgeoning cycling culture in Thailand. For my trip to South Korea I wanted to specifically see and experience the longest portion of the four rivers path for myself. What I discovered was an amazing cycle path, an impressive river revitalization program, and kilometer after kilometer of beautiful scenery. 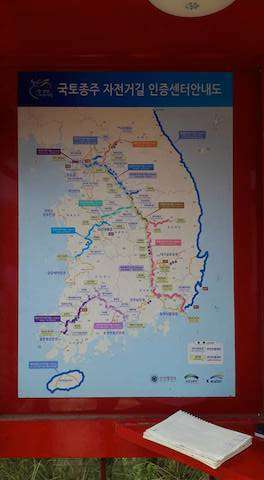 I highly recommend cycling the four rivers path from Seoul to Busan and have compiled details from our trip in order to help others plan their own South Korean cycle touring adventure. 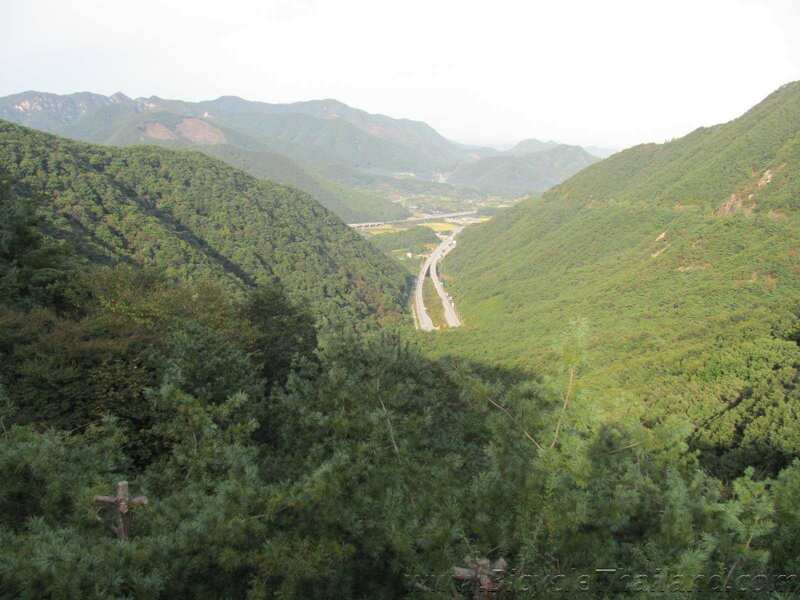 The main four rivers route from Seoul to Busan consists of four connected cycle paths known as the Ara, Hangang, SaeJae, and Nakdonggang pathways. 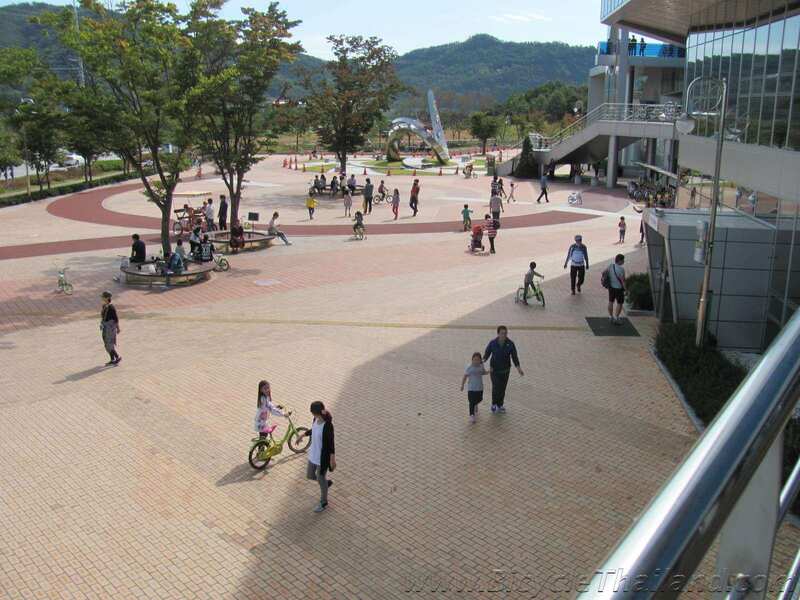 If you are interested in riding some of the other cycling paths in South Korea I can highly recommend the Ocheon, Geumgang, and Buckhangang pathways. Read my other informative article with details and maps of the Ocheon, Geumgang, and Buckhangang pathways here. 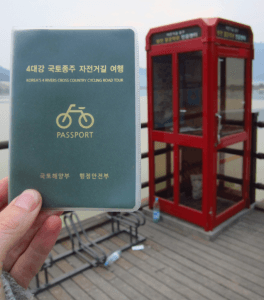 Since we had arranged accommodation in the Itaewon district of Seoul our journey to Busan did not include the first portion of the Ara Bike Path, which begins at the Ara West Sea Lock. Cyclists interested to start from Incheon Airport should take the airport railway to Chongna International City and cycle to the first certification center – Ara West certification center. This is the certification center where cyclists can purchase a passport book and receive their first stamp. Paper maps are available for purchase but we found the detail level on the maps to be insufficient (the map is not big enough to show turn by turn directions of course). Perhaps the maps could be useful if you want to look for town names and compare them to the Korean written on signs. Also, the Ara West certification center can process all four rivers path completion medal applications. How the passport and stamp booth system works – Get a passport, visit all of the certification centers along the cycle pathways where you collect stamps for your passport at each red booth, and then apply for completion medal and certificates. Me and my cycling friend decided to not do the passport/stamp thing and rather just enjoy the ride and our holiday. Most certification booths have bicycle parking racks, tire inflation pumps, and rest areas (as pictured in the photos below). And, of course, every certification booth has an ink pad and stamp so that cyclists can stamp their passport booklets. It has been suggested that cyclists carry their own ink pad just in case the stamp booth ink pad is too dry or, as in some instances, completely missing. I’ve been told by Korean cyclists that a photograph of yourself in front of the stamp booth is sufficient evidence of you being there for the purpose of obtaining completion stickers and medals, but I’d be hesitant to rely on this method since there is the real possibility that it may not be true and, more likely, that you may fail to get the required booth name in your photo (especially if you can’t read Korean). Others suggested using your own blood to effect the stamp in your passport booklet but that seems a bit macabre. If you have questions, comments or concerns about the whole passport, stamp and medal/certificate process you can contact the Certificate Center Operation management. Taking a bicycle on the airport railway is allowed although it is advised to use the first and last cars of the train. You should not attempt to take bicycles on escalators, but rather you should use the elevators to reach the train platforms. The rules for taking bicycles on trains and on the subway differ greatly. 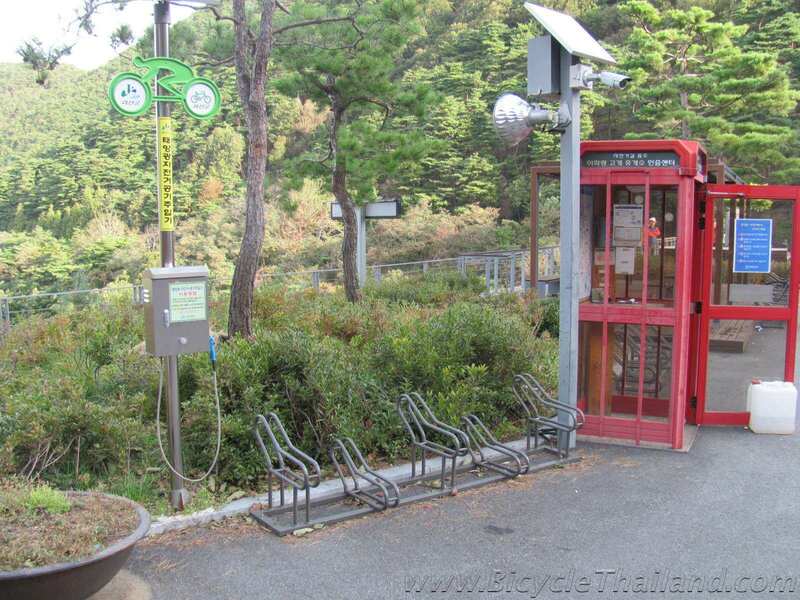 A great source for information regarding taking your bicycle on the Seoul subway can be found here. We chose to take a limousine bus from the Incheon International Airport to our accommodation location in the Itaewon district of Seoul city. The limousine bus we took is the 6030, which has pickup stands right in front of the airport (exit 13). Bus ticket from Incheon International Airport to Itaewon was 15,000 Won per person and bicycles can be placed in the luggage compartment under the bus (easy if boxed or packaged neatly). We rode the bus for approximately 70 minutes and got off in the heart of Itaewon district at a bus stop directly across from the Hamilton Hotel. Follow the 4 Rivers Cycle Path signs. All signs have the 4 Rivers Cycle Path logo in either 4 colors or white as indicated on the below photos. You will also see the 4 Rivers Cycle Path logo painted on the road at times. 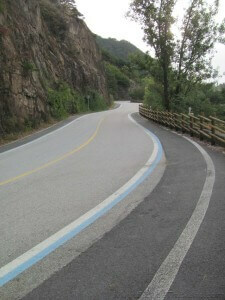 Elsewhere you will see the bicycle path painted with a blue line along its edge. After getting a good night’s rest and a great breakfast the next morning we headed out to begin our 6-day adventure. We left early enough to avoid heavy traffic so it was only slightly frustrating navigating the small one-way streets of Itaewon before we found our way onto the riverside cycle path. As soon as we did finally find the path on the north bank of the river it was very easy to locate and cross the Banpo bridge to the south bank of the river and begin our cross-country journey. The ride out of Seoul was surreal to say the least. Crisp, clean October morning air filled my lungs and chapped my lips as we enjoyed our first day on the cycle path. The entire day was a breeze of a ride, punctuated by beautiful riverside scenery, mountains, tunnels, and converted railroad tracks. The feeling that the cycle path tunnels, bridges, and wooden ramps were purpose built just for bicycles is enough to make any avid cyclist a bit giddy. Along the Seoul city portion of the path were plenty of convenience stores (in Korea you will find CU stores, GS25 stores and, to a lesser extent, 7-11 stores), bathrooms, rest areas with roofs and benches, bicycle parking racks, and nice little Korean ladies selling coffee and drinks at tables under bridges. A bottle of water will be about 1,000 Won while a hot coffee or sports drink will be about 2,000 Won. During today’s ride we saw at least a half dozen bicycle shops alongside the path, some of them selling cycling clothing and offering repair services. Even 7-11 stores along the path have a small selection of bicycle tools, clothes, and accessories. We had lunch at approximately our 70km mark at a Korean restaurant inside a greenhouse on a hill climb (gradient of 10%). A couple of friendly Korean bikers helped us order potato pancakes. The potato pancakes are a recommended menu item from a little note hung on the restaurant’s wall. The potato pancake (GAMJA JEON: 감자전) is like a big hash brown filled with onions and seasonings and is served with a delicious dipping sauce and kimchi. Two large potato pancakes was 16,000 Won along with 2 drinks. There are personal notes all over the walls from thankful cyclists who have visited the greenhouse restaurant. Top 10 Korean foods that you have to try. The number of riders on the path thinned out significantly at about the 80km mark and we seemed to have the pathway all to ourselves for the first time. 4 Rivers Path Gradient Signs – Before climbing sections there is usually a helpful little sign telling you the gradient and length of the upcoming hill. These signs are a welcome bit of information.When we arrived in Yeoju we decided to stay at 7 motel (80,000 Won for 2 persons). Nice lady at front desk allowed us to store our bicycles inside our rooms. Rooms come standard with WiFi, Air Con, bathtub/shower, big screen television, and a large selection of toiletries. Weather – Slight chill in the morning, a bit windy in the afternoon, blue skies, wonderful temperature. Noticed Korean riders wearing long-sleeved jerseys, long pants, and masks to keep the chill off of their faces. We wore shorts and short-sleeved jerseys with light shell jacket (that came off after the morning chill lifted). Traffic – No vehicle traffic, even on the few short sections of path where bicycles and cars share the road. Aside from the beautiful scenery of South Korea I would have to say that the near total absence of motor vehicles is the highlight of the cycle path. Motel: Story Motel (30,000 Won x 2 people). Story Motel is in the small town of Gaeson, located about 10 kilometers past Suanbo. On today’s ride we experienced the first two small sections of packed gravel and dirt roads. At one point we came across a 300 meter section of cycling path that was under construction but still rideable. It looked as though they were widening and resurfacing the path and the temporary signs let us know that the route ahead was still open. There were no tunnels on today’s ride but we did cross several bridges, so many in fact that I lost count. It is a truly great feeling to be riding across a massive bridge on a purpose built cycle pathway taking in the beautiful surroundings without having to worry about motor vehicle traffic. The bridges in South Korea all have a unique design or color scheme, each one is distinct. I found myself anticipating what the next bridge would look like. We encountered several road cycling groups of eight to twelve riders, including men and women, out on the path today. It’s important to remember to remain in your cycle path lane, especially around blind corners and while riding uphill. At the 21km mark of today’s ride we decided to venture into a small town alongside the path to find something for breakfast. We were joined by two chain-smoking Korean men who were also interested to find something to drink at one of the small town’s convenience stores. We loaded up on bananas, sweet bread and coffee and bid farewell to the two Korean men after we politely declined their offer of cigarettes. Yes, you will notice Korean men at rest areas along the path stopping to have an obligatory smoke. Last third of the day’s distance was on shared roads with a minimal amount of motor vehicle traffic. We ate lunch at a food cafeteria type place not far after the certification booth at Chungju Tangeu, just before the day’s 70km mark. We have noticed a lot of camp sites along the cycling path today. They seem to be open and available for use by anyone although we did see signs indicating that cooking stoves and camp fires are prohibited. We reached the city of Suanbo with a minimal amount of climbing. There is a great sign at the certification center in Suanbo that shows the location and names of many of the city’s motels and hostels. Suanbo is a popular destination for Korean tourists who visit the area to soak in natural hot springs. You’ll know the motels and hotels that offer hot springs if they display the sign that looks like a steaming bowl of food (shown on left). 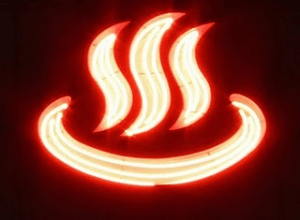 We mistook this sign several times for a place that would sell us noodles. The first of two big climbs starts immediately after leaving the city of Suanbo. Depending on your riding ability you may want to overnight in Suanbo and set off the next morning to tackle the two biggest climbs of the entire route. Another option is to tackle the smaller of the two climbs and then overnight in a little town called Goesan. ***There is a very small town which I believe is called Goesan that lies between the two big climbs. There are two motels in Goesan and they offer an alternate option to staying in the town of Suanbo at the end of Day 2. An overnight stay in Goesan would allow a rider to get the smaller of the two big hills out of way on Day 2 and save the more difficult of the two big hills (5km hill climb) for the morning of Day 3. Suanbo has far more motel and restaurant options than Goesan but can be crowded on Korean holidays and weekends as it is a Hot Springs tourist destination. Goesan has very limited options for restaurants, and because of this we ended up buying noodles and drinks from the only mom & pop convenience store in town and eating in our motel’s lobby area. Goesan consists of two motels, one bus stop, a flower tea research center, a Hanji museum, and one local convenience store (Not a CU or GS25). 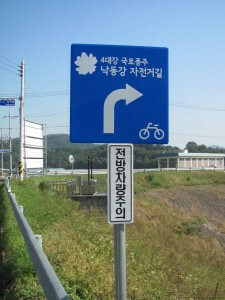 The big hill (5km) starts immediately after the Haengchon Crossing certification center on today’s route. At the top of the big climb is the Ihwaryeong certification center. We saw only two cars on the road while cycling up to the top of the big climb and only one car on the way down – Yeeeeha!!! There is a bike friendly motel just at the bottom of the big climb. The motel sign has an image of a bicycle on it and when I saw it I felt like this motel would probably make a great overnight stay location for riders heading in the opposite direction (Busan to Seoul) who may want to stop for the night and attack the two big climbs between them and the town of Suanbo first thing in the morning. We decided to have our breakfast at a 7-11 convenience store after coming down the big hill from the Ihwaryeong certification center. At the 7-11 store there are many motel and restaurant choices. We also noticed that several motels in the area have bike lockers outside of them, so they must have a lot of cyclists stay in this area. There are little short and steep hills on the last 30km of today’s route. Roller Coaster Park 1 & 2 – We rode past two separate roller coaster type parks that appeared to have pedal-powered open air seats attached to rail lines that went around a scenic mountain area. The parks were closed when we passed (maybe too early in the morning or perhaps the wrong season) and we were later told that these attractions are very popular in the spring and summer months but people didn’t like to visit them during winter. STEEP HILL!! – The only section of the entire cycle pathway where I had to get off of my bike and push it uphill. The steepness of this hill might be tackled by someone on a very low geared mountain bike, but certainly not by us with our bikes and loaded panniers. More lovely scenery today with one short tunnel passage and a few bridge crossings. The scenery is kilometer after kilometer of farmlands with majestic mountains in the distance and the always present river. We visited the Sangju Bicycle Museum –Wonderful museum with a large outside riding area that was full of parents teaching their kids to ride bikes (we were there on a weekend). You can spend as little as 20 minutes seeing everything in the museum but it is still certainly worth a stop. Since the cycle pathway passes directly in front of the museum you can stop in and have a look around and be right back out onto the path quickly. 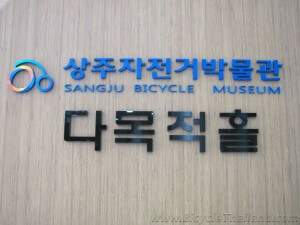 A short distance after where the Sangju Bicycle Museum is located on the pathway is a small island where the four rivers path will direct you to go, but unless you fancy a short loop ride around the island you can simply pass this island by and continue on the pathway without crossing over the small wooden bridge. At the Sangjusangpoon certification center we saw signs for a 31km MTB trail and noticed spray painted MTB signs on the four rivers pathway with arrows that led away from the paved portion. We also saw several cars in the Sangjusangpoon certification center parking lot that seemed to indicate it could be the meeting/start point for mountain bikers accessing the off-road trail. Very interested to investigate this MTB trail at some later date. We did not stop for lunch today, but instead waited until we reached our destination of Nakdong-ri before settling in to one of the many Korean Bar-B-Q restaurants along the river for what we considered our late lunch/early first dinner. At the end of today’s ride we stayed at Phoenix Motel (written in Korean-as many of the motel names are). 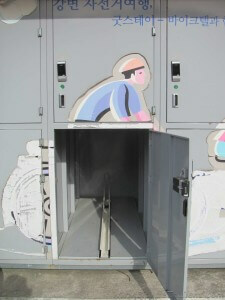 It was our first opportunity to make use of bicycle lockers on our ride. The attendant, who we later learned was the owner of the motel, assisted us with placing our bicycles inside the lockers and then showed us how to open and close the electronic locks. The bike lockers are a really cool system that keeps your bike safe and secure and eliminates the need to lug your bike up four flights of stairs to your room. After storing the bikes and cleaning ourselves up we headed to yet another Korean Bar-B-Q restaurant next to our motel in order have second dinner. Korean culture side note – Older Korean guys like to squeeze my leg and/or slap my thigh to confirm/affirm that my legs are strong and therefore capable of accomplishing the journey all of the way from Seoul to Busan. Get used to it, it will probably happen to you at least once during your journey. Before heading out of Nakdong-ri we rode down into the small town behind Phoenix Motel and had our breakfast at the CS25 convenience store. It’s always a good idea to use these stops as an opportunity to throw an extra package of cookies or whatnot into your pannier for later in the day. Dragonflies are abundant all along the pathway of today’s route. I’m not sure if they are an all year round kind of phenomena along the pathway or just more active in the Fall. Either way, they add a nice feel to the beauty of the ride and never got to the point where they were an annoyance to us while riding. However, the face full of gnats I experienced while rounding a corner on Day 1 of our ride was quite unwelcome and I have been assured by many Koreans that if I had chosen to ride during the spring or summer months I would have many more gnats and also mosquitoes to contend with. Once again, I’m reassured that I chose the correct time of year (October) to ride the four rivers pathway. Today’s ride had the most amount of kilometers of pathway next to a big highway that we have ridden on so far. The pathway is separate from the highway by more than 10 meters but the view to the left is just highway traffic so I found myself staring to my right for most of this stretch. We stopped in at a Cafe/convenience store that caught our attention because it had a small shipping container bicycle shop in its parking lot. We also saw a sign for pizza, but unfortunately the pizza restaurant was not yet open (too early in the morning when we arrived). The pizza restaurant is called Pizza 400c. After gobbling up our snacks at the Cafe we continued to ride all of the way to the certification center at Dalseongbo where we had our ‘lunch’ at a convenience store. We rode through the city of GUMI. Gumi is an industrial city and it was the only portion of the entire ride where the air quality seemed a bit less than perfect. The air smelled a bit like super glue to me and the general feel of the city gave me the impression that it would not prove to be an overly wonderful city to spend the night in. Perhaps if you were in need of big city items you could overnight in Gumi but for us it was a city that we wanted to quickly put in our rearview mirror. After passing uneventfully through Gumi we reached the Gangjeonggorye certification center. The little city just before this certification center would be a good option for a lunch stop location but as we were making good time and not really yet hungry we decided to press on towards Daegu. Sign ambiguity can simply mean that you have an option to continue on the main route or divert to an alternate route through a city or park. At two different points on today’s route I feel like we might have missed a sign and mistakenly ridden up to a bridge from the wrong direction. This isn’t a huge problem as most of the bridges along the path can be accessed from either side because they have to accommodate Seoul to Busan direction riders as well as Busan to Seoul riders. Going up to a bridge from the pathway using the incorrect ramp simply means that you’ll have to ride across a lane of motor vehicle traffic to be able to cross a bridge going in the same direction as traffic. Since there is so little motor vehicle traffic crossing most of these bridges it usually doesn’t make a huge difference from which side you access them. In Hyeonpung-Myeon we settled into the Elegance Motel for a price of 40,000 Won for each room and after storing the bikes inside the rooms and catching quick showers we headed out for a late lunch/first dinner at a Chinese style noodle soup restaurant. The ubiquitous metal chopsticks Koreans use can make eating meals a bit difficult (or a new learning experience) for people who are not used to them. After late lunch/first dinner we took a walk around the city and discovered the last remnants of a day market that seemed to be closing up just at dusk. I bought a sugared doughnut treat from a vendor who seemed overly vexed that I wasn’t willing to relieve her of 1 kilogram of her remaining stock. I don’t know anyone who buys doughnuts by the kilo so I reluctantly obliged myself to purchase two doughnuts from her for 1,000 Won. The vendor seemed rather fussed by the minuscule transaction. After wandering the half dozen streets that the day market occupied we started back to our motel and, to our delight, discovered a pizza restaurant. We invaded a table at 59 Pizza and promptly ordered up one pepperoni pizza (a safe bet) and one potato pizza (the risky bet) to ensure we didn’t leave disappointed or hungry. The pepperoni was as expected but the real surprise was the potato pizza – a definite winner in our book. We’ll be looking for this flavor again and are hoping that it’s available at other pizza shops in Korea. 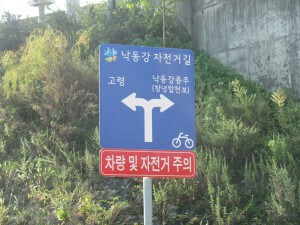 Getting back on to the cycling path was a little bit confusing when leaving Hyeonpung-Myeon. There is an inner city bicycle path that appears to be the 4 rivers path but, in fact, it is not. After riding down what eventually ended up being a sidewalk cycle path for a short distance we stopped in at a 7-11 convenience store to wrestle up some breakfast items. After finishing up breakfast and stuffing a few extra doughnuts and bottles of water in our panniers we headed back towards the Elegance Motel in order to pick up the 4 rivers path again. At one of the intersections at the edge of the city we saw a Korean cyclist standing on the opposite side of the road from us staring at a paper map. We pedaled across the intersection to chat with him and without any ability to communicate in Korean we quickly surmised that he had also fallen victim to the same inner city cycle path signs that we had. Later in the day, when we stopped at the CU convenience store at Hapcheongchang certification center we met up with the same Korean guy we had seen earlier in the morning at the intersection while leaving Hyeonpung-Myeon. I nicknamed him Silent Bob as he does not talk much but gets by communicating with hand gestures, smiles and the occasional thumbs up. Evidently he had also found his way back onto the 4 rivers path. Perhaps we had all missed the same sign? At the CU convenience store we also met Jong, a Korean executive working at LG who was cycling from Seoul to Busan as well. His English was quite good and he helped us to decide, using Silent Bob’s paper map, to overnight in the small town of Susan rather than in the city of Namji-eup as we had planned. Staying in Susan would make our last day of riding short and pleasurable and put us into the city of Busan much earlier than if we had to cycle there from Namji-eup. On today’s route we passed the small town of Angjin-ri. Angjin-ri looks like a good option for an overnight if your daily distance dictates such a stop. We saw at least three motels, one convenience store, and a couple of different restaurant options in Angjin-ri. We didn’t stay in Angjin-ri as it would have made it an extremely short distance day for us. Thinking that all of the BIG hills were well behind us, the significant 13% gradient hill as well as two other ‘bumps in the road’ that we experienced today are definitely worth a mention. The first climb is long and tough and at 13% gradient it was no surprise to come upon other riders pushing their bikes the last 200 meters to the top. Also, on today’s ride there is a short but steep climb going up to what I can only assume is a buddhist temple. While approaching this STEEP climb we heard monks chanting over loudspeakers and took them on as our own personal cheerleading squad, willing us to not give up, orating us to overcome and achieve nirvana, which I assumed would be at the top of the climb. Even after attaining Nirvana the route still has a few short but steep climbs (at least 2) to throw at you before your arrival into Namji-eup. We met two young Australians (John and Angus) at the top of one of the last short steep climbs just before Namji-eup and invited them to have lunch in the town. We stopped for lunch at a small Korean restaurant (just after the bridge out of Namji-eup) to meet and eat with John and Angus. They turned out to be a rather friendly and fun-loving pair and we were happy to meet them. The owner of the Korean restaurant is a nice lady who was kind enough to show us how to eat the meal she prepared for us. We attempted to order Bibimbap but what appeared was certainly some kind of variant of the popular dish. What she brought us was cooked rice in a bowl that she instructed us to spoon out and then fill the bowl with HOT (HOT HOT) water from a teapot. I believe this variety of Bibimbap is called Dolsot Bibimbap (돌솥 비빔밥). She then showed us how to eat the many other dishes on the table while intermittently ducking back into the bowl for a spoonful of slightly crunchy (burnt from sides of bowl) rice and HOT water. Before leaving the restaurant the owner gifted a book of Korean poems, which she authored, to John and showed us photographs of her with the local cycling club while proudly proclaiming that she had ridden to Busan many times herself. After lunch, we cycled together with John and Angus to the small town of Susan where we all decided to overnight. John’s fluent Korean (the ability to say ‘one’ ‘here’ and ‘mosquito’) came in handy as he negotiated three rooms in a 2nd floor motel for 25,000 Won each. The town of Susan has at least two motels, a convenience store, and two or three fried chicken and beer restaurants. Also, Pizza Bingo and Bread & Bake shop are located just across the street from the town’s CU convenience store. We enjoyed Pizza Bingo for late lunch and early dinner (6,000-9,000 Won each pizza pie) while making a scene of ourselves outside the town’s CU convenience store. Every convenience store in South Korea seems to have tables and chairs that are available for use by anyone, even if you have arrived with your own pizza and beer purchased elsewhere. While we munched our pizza pies and gulped our cold brews the local populace of Susan did frequent drive and walk-bys in order to catch a glimpse of the newly arrived foursome of foreign cyclists. Bread & Bake shop opens at 7am and is a good place to pick up a few treats for breakfast. Lots of fog this morning. Set off at about 7:30am and the fog remained thick for more than an hour of our ride. On our last day of riding we saw a small Korean deer standing on the cycle path. As we approached he quickly jumped back into the tall grass and disappeared. We did not even know to expect deer in the area. Seeing him there standing in the morning fog was a cool and unexpected experience. 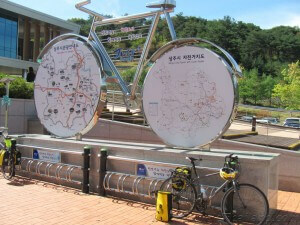 Completed, in progress, and planned cycling routes in South Korea. Click on image to enlarge. The last day’s ride into Busan was mostly flat and we seemed to be taking it at a leisurely pace, no one was in a rush for the journey to be over. At a drink stop under a bridge, before entering Busan, Angus treated us all to a bottle of Makgeolli (막걸리), a Korean rice drink shared on a daily basis by friends and drank from metal or wooden bowls. It is tradition for younger drinkers to fill the bowls of older drinkers. We experienced a lot of pedestrian foot traffic using the cycle path as we entered the city of Busan. Inside the city the cycle path becomes a bit skinnier and the number of walkers, joggers and cyclists increases sharply. A bicycle bell to warn people of your approach is very helpful. Riders interested to go all of the way to the start/finish mark at the Nakdong river certification center (‘Nakdonggang’ on cycle path signs – Gang means river, so Nakdonggang is Nakdong River) will see many motel and hotel options off to their left in Busan city. The final certification center is just after a bridge crossing that leads over to Eulsukdo Island. Upon arrival at the finish point we found Silent Bob and Jong sitting at a table outside 7-11. We took our triumphant finish photo and sat down with our newly made cycling friends to enjoy yet more Makgeolli before saying our final goodbyes and departing in separate directions. John and Angus were off to enjoy the beautiful beaches of Busan for a couple of days while Silent Bob and Jong had to return to Seoul for work the next day. Me and my cycling friend had plans to cycle through Busan (13.5km route), have lunch, and arrange our return trip to Seoul by way of Korea’s High-Speed Train (KTX). After cycling from the Nakdong river certification center, through Busan city, and arriving at the Busan train station we bought KTX 1st class train tickets for 83,700 Won each and departed Busan at 8:30pm to arrive at Seoul station at 11:15pm. KTX train tickets start at 48,000 Won and go up to 84,000 Won. The train station does have rental lockers so you can put your bags in a locker while you go out to explore Busan if you have a few hours to waste before your train departs. Bikes are surely allowed on the KTX. You just need to disassemble the bike (by removing both wheels) and make it compact enough to fit in the luggage spot towards the back of each train car. Make sure to secure it so that it doesn’t fall and hit other luggage or passengers. This is what we were told by the train staff. We think it also helped tremendously that we were riding the KTX train on a weekday and at night. There were very few passengers on the train when it departed Busan but more passengers boarded at the six or seven stops it made on the way to Seoul. After arriving in Seoul it was an easy, uneventful ride along quiet city streets to our accommodation in Itaewon district. Getting from Itaewon district (in Seoul) back to Incheon International Airport was as easy as catching the 6030 limousine bus across the street from the Hamilton Hotel. Bus ticket to Incheon International Airport is 15,000 Won per person and bicycles can be placed in the luggage compartment under the bus (easy if boxed or packaged neatly). Weird things we saw along the cycle path – Almost every day of our trip we saw couches, chairs, and office furniture along the pathway. The furniture was usually next to a farm road or under a bridge. Most of it looked to be in good condition so our only conclusion was that maybe people actually put the chairs and couches there to use as a resting area or maybe to have a place to sit under a bridge if it were raining. Food advice – Picky eaters will have limited choices in the smaller towns. Expect to eat Korean food in towns along the pathway. Western food choices are available in Seoul and Busan. Expect to have to use metal chopsticks at restaurants. It would be helpful to have four or five common Korean food dishes that you enjoy written in Korean (Hangul) on a piece of paper that you can carry with you to lunch and dinner spots. It will be fairly useful to recognize the word motel in Korean. We decided that the symbols looked like a television (or computer monitor) followed by E-11 over the number 2. Motels – Motels will allow two people to occupy each room. Three or more in a room as a money saving practice will be frowned upon and you’ll likely be refused a room. There does not seem to ever be a room option where two twin sized beds are in one room. So, plan to budget for separate rooms if you have a traveling companion that you do not want to share a bed with. All motels we used were happy to show us the room before we paid and we never had a problem with storing our bicycles in our rooms where necessary. The 12 Types of Korean Hotels Explained. Good advice we received about motels – Keep in mind that it’s often easier to find accommodation in small towns rather than bigger cities like Daegu, Gumi, and Chungju. When you arrive close to a big city, it’s just farmland or suburbs, not accommodation you can see from the cycle path. 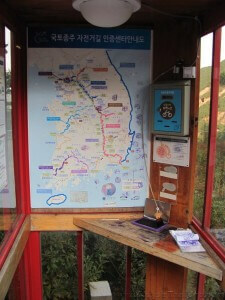 Much easier in Busan to stay in Sasang near trail end and get an Express Bus back to Seoul from big bus terminal there. No problem to put bikes in bus cargo hold. Many love motels around the area. We found Max Motel very bike friendly, great rooms and they even washed our bikes. From Busan to Seoul take the express bus from the express bus terminal at Nopo station on the No.1 line, also known as the Orange line to Seoul (Goseok bus terminal). 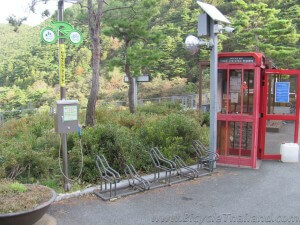 Another option that may be easier is Busan Sobu bus terminal. 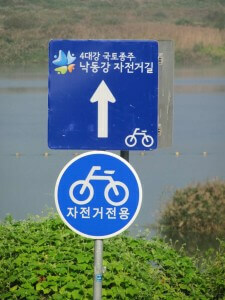 After you have reached the last certification center (Nakdong River) turn around and go back along the bike path. It is about 20 minutes by bike. It will save you the hassle of having to take the subway line. The terminal is next to Sasang subway station. The bus will take you to Seoul Nambu bus terminal. If you arrive late and you don’t want to bus back that same day, there are lots of love motels just east of the final certification center (Nakdong River). Take the Mungunghwa train around 11.15am slot which cost 28,600 Won (5.30 hour journey). No advanced booking required. Carriage No.5 on this train is known as the train cafe where fully assembled bikes are allowed to be stored. How to buy cycle friendly train tickets using Korail App. The Mugunghwa trains take longer than the Saemaeul or KTX trains because they go further afield on lesser-traveled lines making stops at smaller stations. 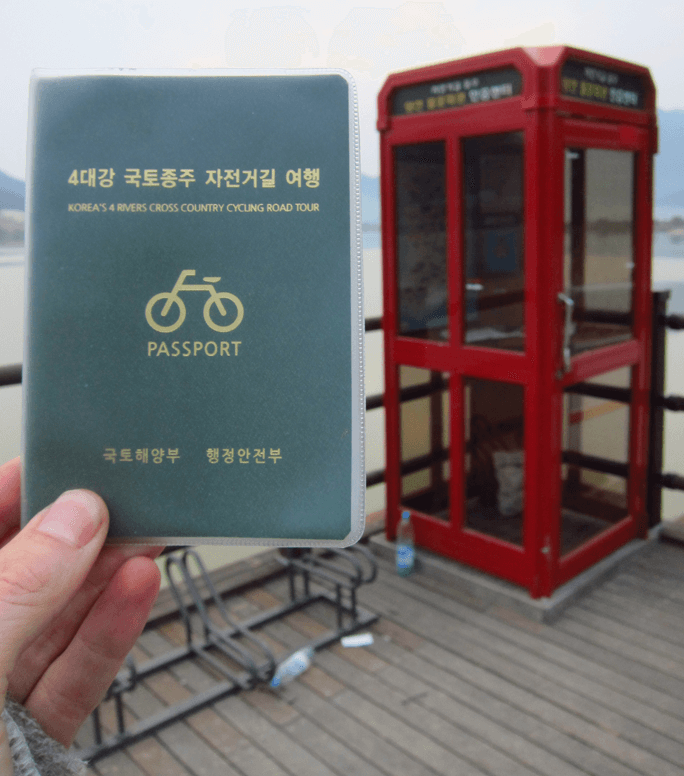 View my South Korea bicycle trip packing list.